Misikko.com is letting me give away a Hana Professional Flat Iron to 1 of my readers! PLEASE FOLLOW THEM CORRECTLY OR YOUR ENTRY WILL NOT COUNT!! 3. Leave a comment saying "Enter Me!!" along with your name and email..
and tell me what it is that you like about my blog or what you would want to see more of. Subscribers: make sure you leave your email that you subscribed with and remember to activate your subscription! That's a total of 8 entries!! I really love your blog you have a mix of everything! I would like to see outfits of the day because I love seeing what others are wearing! Also your very beautiful! I love your hair! Already signed up for thte Misikko Newsletter! I follow - Pls enter me! I really love your blog because you blog about different topics. It would be nice if you did more OOTD posts. I already signed up for the Misikko Newsletter. I like your OOTD posts the most! I would like to see more reviews because I like to see what works and what doesn't for other beauty bloggers. I sent you a request to follow you on Twitter and I twitted about your giveaway (my username is GabyFauchon). Well, I love a lot about your blog. I definitely like your hair and beauty blogs and your cupcakes always look delicious. oh yeah I'm following you on twitter and tweeted and following Misikko Twitter. Enter me please! I'm a new follower! I love the fact that you are a LATINA blogger. I also like how you have the image link to your Twitter and Facebook without having to search you etc. i posted a blog about your giveaway... check it out here. I follow your blog because I love reading your post and admiring your beautiful cupcakes. Even though im on a diet I lust over your pics. HEHE. but I would love to see more outfits of the day because your style is so cute. sent a request to follow you and retweeted this giveaway! Following on GFC, please enter me in! I already follow your blog because of your great EOTDs, would like to see more FOTDs. Your blog incorporates my two favorite things - adorable looking desserts and beauty! and um, hmmm you cover a lot of basis. i guess more fotds? I'd really love to see more of the cupcake pics. Yummy. I like the variety of your blog and would love to see some reviews! Signed up for Misikko's newsletter! i also followed misikko on twitter! I subscribed because i love all the pink!!!! My favorite thing on your blog is when you post an outfit of the day.. also, I'm not much of a make-up kinda girl but I probably would be if I could do it like yours! your eyes always look AMAZING!.. keep up the cute posts girl! annnd I subscribed to the Misikko newsletter! I love the name of your blog and the colour scheme. I would love to see more giveaways. I am already signed up for misikko newsletter. I am following Misikko on Twitter! I absolutely love your blog because it is so girl and definitely one I can relate to. I love when you post products that you love because more often than not it is something I end up liking. Please enter me as I feel like us girls and Canada can't get a lot of the things in the states and I don't have a credit card so I don't really sop online! Love the make up discounts! Sent follow request and tweeted! Signed up for misikko's newsletter. Fan on FB. Natoma H.
AND I LOVE that you post how to eye shadow application! I'm pretty good with my makeup...minus the shadow. So help is MUCHO needed! I just found your blog by passing- I really like it! I definetly will stay posted! Love your blog and how you do make-up!! I love the good music you have on your blog, the outfits of the days, & makeup looks plus the cupcakes lol I never knew they had the red velvet mix until you posted about it! I'd love to see more outfits of the days because your style is unique & I really love it. 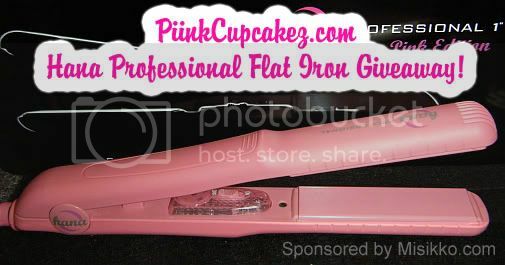 sent request on twitter & RT "Check out @piinkcupcakez Pink Hana Professional Flat Iron Giveaway from Misikko! www.PiinkCupcakez.com"
Please enter me into your giveaway! I'm following your blog because I love your style! Please do more OOTDs. Also, I would love to see clothing hauls! :) Thank you so much! i am new here so i dont know what i would like more of but i like all the info on makeup , and how to use it etc GREAT !! I am following you via google connect (shay) and subscribed by email and confirmed. I love the name of your blog. I just found you but from what I can see it's attractive, well set-up, and informative. Exactly what attracts me to blogs! I like this great giveaway on your site and hope to see more. I love your EOTD's, so I'd love to see more of them! i love ur blog it helps my with everything i need to know whats glamin and not please pick me to win!!! I love your blog because it's helpful and inspiring. You're so pretty and whenever I read your blog, it makes me want to go shopping. Haha. I'm a follower! Enter me please. :) I'd love to see more outfit of the days! i would love to see more reviews and swatches! i am also signed up to the newsletter! I enjoy seeing all of the great pictures of your fashion, accessories, and the recent post on make-up brushes! I signed up for the Misikko newsletter! sent a request to follow your twitter & i also tweeted. your blog def needs more outfit of the day! i love ur clothes!